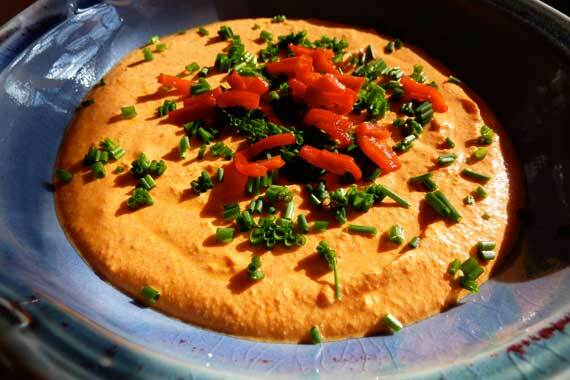 The basic recipe is approximately equal quantities of feta cheese and roasted red peppers. I find it easiest to use an immersion blender to purée them together. Remove excess moisture if you use jarred peppers (by squeezing them like a sponge). Rough chop peppers and break up cheese into container. Blend away. Pour into serving container. Eat with crackers. If you’re thinking Greek, stir in some thyme leaves or chopped oregano. In my experience, cleanup is trickier than you’d expect. The blender end gets a red film on it that is a bit difficult to remove. You have to rub, not just rinse. In the photo, I kept back a bit of pepper (jarred) for the decoration, with some chives. This would also be good as a dollop added to soup, for example.